Most bodybuilders get the extra protein they need to support their intense training regimens from animal sources. Building a muscular physique is possible using vegetarian sources of protein. Like meat-eating bodybuilders, vegetarian bodybuilders precisely time their meals and spend time preparing their food plans. A vegetarian bodybuilder may have to incorporate a few extra strategies to support his goals, but he can avoid animal products and still be a formidable competitor. The features of a vegetarian bodybuilding diet depends on the type of vegetarian diet followed. Medline Plus outlines three primary vegetarians: the vegan, who excludes all meat and animal products; the lacto vegetarian, who eats some dairy along with plant foods; and the lacto-ovo vegetarian, who eats both dairy and eggs along with plant foods. Vegan bodybuilders face the most challenges in obtaining proper nutrition, but they can still obtain all the necessary vitamins, minerals and amino acids required to build muscle. Bodybuilders who are vegetarian consume primarily fresh fruits and vegetables, whole grains, nuts, seeds, soy and beans. Complex carbohydrates like oatmeal, brown rice, quinoa and sweet potatoes provide energy for workouts and muscle development. Essential fatty acids found in walnuts, flax seed and almond butter help regulate hormones important to muscle growth, says fitness expert Anthony Ellis of Iron Magazine. Bodybuilders should get about 2 g. of protein per kilogram of body weight, or about .9 g. per pound, as recommended by the International Society of Sports Nutrition, or ISSN. Complete proteins containing all of the amino acids that humans cannot produce on their own are optimal. 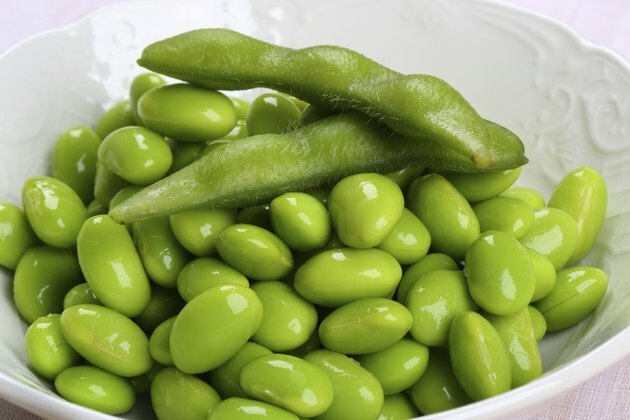 These are usually found in meats, dairy and eggs; soy is the only complete vegetarian protein. Lacto and lacto-ovo vegetarians obtain protein through milk and eggs. While some meat-eating bodybuilders shun soy-based proteins, a study in the Journal of Nutrition in 2004 found that soy-based protein bars were just as effective as whey-based bars in enhancing exercise training-induced lean muscle mass after nine weeks. Vegetarian bodybuilders usually follow the same six mini-meal protocol as carnivorous bodybuilders, which includes eating a small meal every few hours to ensure a constant flow of nutrition and adequate daily calorie intake. Each meal contains some carbohydrates, fats and between 20 g. and 30 g. of protein. Combining incomplete proteins, like beans and rice or lentils and millet, helps vegetarian bodybuilders obtain all the essential amino acids they need to support muscle growth. A bodybuilder should take in some form of protein around the time of training to help muscles grow and repair, says the ISSN. Soy protein shakes or meal replacement bars are convenient ways to meet these dietary needs. Bodybuilders usually emphasize whole foods in their diets to avoid excess sodium, added sugars and refined flours. Vegetarian bodybuilders are no different. Robert Cheeke, Elite Vegan Bodybuilder, discourages relying on vegetarian “meats” like hot dogs, sausage and burgers. Vegan Body Building and Fitness: Vegan Athletes: How Do You Get Your Protein?